National Crop Insurance Services made p ublic today a video discussing the Texas drought and how crop insurance helped farmers and ranchers pick up the pieces after the disaster. The video features a grower and a banker from the state. Please share the video link with anyone who might benefit from watching it – it truly does speak to the value of crop insurance. Please find the video linked here. The number one goal of a crop insurance agent is to put the farmer first. Ruth Gerdes, farmer and crop insurance agent from Auburn, Nebraska knows this as well as anyone. Here you will find a document Ruth put together that details the work the Auburn Agency does on a month by month basis over the course of a year. This is the process Ruth and her team goes through for each and every client, taking special care to fully educate them on their risk management options available. Find the month by month description of the work done by a crop insurance agent here. See the importance of Crop Insurance to your state by clicking on the linked factsheet. Or view a summary of the entire United States. If you are interested in a state that is not listed, please feel free to contact us at judd@combest-sell.com. State factsheets: Arkansas, Colorado, Georgia, Indiana, Iowa, Kansas, Kentucky, Michigan, Minnesota, Mississippi, Montana, North Dakota, Nebraska, New York, Ohio, Pennsylvania, South Dakota and Vermont. National Crop Insurance Services created the following educational video featuring Tom Zacharias, President of NCIS. 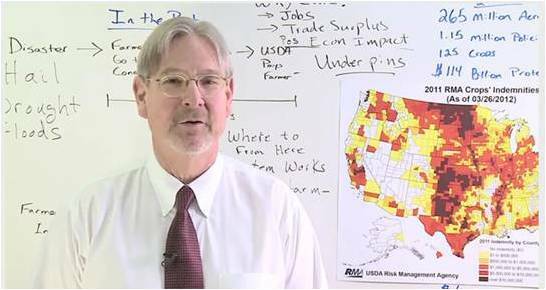 The short video titled “Crop Insurance 101” consists of Mr. Zacharias explaining how Federal Crop Insurance works using a white board. We hope you enjoy. Welcome to the New CIPA Website! We are thrilled to welcome you to the new CIPA site, now primarily hosted at www.cipatoday.com. The site offers a variety of resources both to members and the public. Please take advantage of the educational information available, and check back often for news and updates. The ability to join CIPA online as a Supporting Member for only $10. For more information about CIPA membership levels, click here. Information about CIPA events and a frequently updated calendar. The resource section for CIPA members includes business and policy resources, member-controlled profile pages and material about the CIPA Political Action Committee. Full and Associate Members can access the Member Directory, upload their logo and update email preferences, access current and archived newsletters in one convenient location and see event registration and teleconference information. Please take advantage of this new site, and let us know if you encounter any problems by emailing judd@combest-sell.com. Growing up and working on my own family farm during hard times, and devoting much of my adult life to U.S. agriculture, it is a source of pride that I was privileged to help put in place the kind of farm policies that pulled the sector out of crisis and have contributed to a strong 10-year run for U.S. agriculture. What follows are what I consider to be some essential elements to keeping it going and continuing to lead economic recovery, putting Americans back to work, and feeding a hungry world. First, the agriculture community must unite, on and off Capitol Hill, and work together to pass a strong, consensus-based Farm Bill in 2012. American agriculture needs the certainty of a 5-year Farm Bill, and unity is not optional if we are to get there. Fortunately, I believe this is eminently doable. Although there are many different plans and details, there are common themes that reflect the following principles. The 2012 Farm Bill should: (1) do no harm to crop insurance; (2) not shoe-horn a dynamic private sector into a one-sized-fits-all federal program, but give producers the opportunity to make their own choices based on what is right for their farms; (3) provide producers real market loss protection that is relevant to today’s risk profile and would kick in when needed; and (4) not tie producers up in knots with more bureaucratic rules that stifle innovation and competitiveness. Do Not Harm Crop Insurance. Fortunately, on the issue of crop insurance, virtually all in the farm community have rejected proposals that directly harm this vitally important risk management tool, opposing calls by a few for more cuts, for government-run delivery, or for undermining individual coverage by subordinating that coverage to group risk plans. But, what we learned from the 2011 Farm Bill effort is that the host of revenue proposals do have some interaction with crop insurance. The Congressional Budget Office (CBO), for instance, apparently assumes billions of dollars in indirect cuts to crop insurance due to this interaction. Thankfully, in working to address this problem, Senator Roberts (R-KS), Chairman Lucas (R-OK), Chairwoman Stabenow (D-MI), and Rep. Peterson (D-MN) wisely insisted on reinvesting these savings back into crop insurance to make it better for producers. There is a legitimate interest motivating revenue proposals and that is to help producers reduce deductibles. But, it is important that nothing be done to injure crop insurance which so many producers have urged Washington to protect, and which Rep. Peterson has time and again warned may be all producers are left with one day. In carefully threading this needle, the objective must be to meet the goal of revenue proposals - i.e., closing deductibles - without duplicating what crop insurance already does so well. A uniform revenue proposal attempting to accomplish this difficult balancing act when deductibles vary so widely by state is met with a serious challenge. One revenue band of protection applicable to all states leaves producers with shallower or deeper deductibles both exposed. One possible solution to reconcile the competing goals presented is to allow producers to purchase a supplemental coverage option, essentially an enhanced GRIP or GRP policy, on top of their individual crop insurance coverage. This approach would allow producers to select the additional coverage that they need without duplicating what their individual policy already covers. Via crop insurance, higher levels of coverage meant to address shallower losses would be very defensible in that producers would pay for this additional coverage. This cheaper route to revenue protection might also allow any savings to be dedicated to helping producers buy higher individual level coverage, a benefit to producers in states with deeper deductibles. The bottom line here is there needs to be a thorough analysis of plans designed to close deductibles in order to ensure this goal is met effectively for producers in each state while not harming crop insurance. If reinvesting any savings from the interaction between the two would still harm crop insurance, albeit indirectly, producers and policymakers need to be informed of this. Crop insurance has not ascended to such vital importance to so many producers over the past 10 years by accident. It is the product of good policy which makes a menu of risk management options available to producers that are tailored to producer needs and delivered by a private sector workforce of agents and companies in a manner that has taken crop insurance from a government run program that barely limped along for more than 40 years to the success story it is today. This trajectory needs to continue in order to meet the needs of all crops and all regions. On the issue of producer choice, affording producers the ability to choose a risk management tool in the Farm Bill shows government’s respect for a diverse and dynamic private sector. Most revenue proposals are designed to address deductibles but not deep price losses, while price-based protection plans are designed to address systemic, deep price losses but not deductibles. A choice between these options allows producers something basic: the ability to connect the most relevant policy to their most significant perils. Put into perspective, offering snow tires to everyone in the country has a different value to someone in Alaska verses someone in the Florida Keys. The Environmental Working Group and Bruce Babcock at Iowa State, on some days, advocate government delivery of crop insurance or at least the assumption by the Farm Bill of some duties now performed by crop insurance, while, on other days, they seem to advocate the elimination of both policies altogether. Perhaps they see one as naturally leading to the other or at least an opportunity to attach a bunch of strings. Protecting crop insurance and providing a producer the choice of a price-based protection option would help us to avoid any blind alley they would take us down by working to keep the Farm Bill out of the crop insurance business. There are good reasons for both revenue protection and price-based protection. But since the latter is often singled out for criticism, I think it is important to come to its defense. The approach is simple, bankable, and defensible. Producers and lenders understand it. It kicks in when needed, and backs off when it is not. It is a smart, conservative use of limited resources. While some have suggested that this option might create unforeseen budget exposure in times of prolonged low prices, in its scorekeeping CBO takes the probability of this happening into account and builds it into its cost estimates. Although the cost estimates from the 2011 Farm Bill have not been made public, I would venture to guess that the price-based protection option was the considerably less expensive of the two. This is not an incrimination of the revenue option, but simply an exoneration of the price-based option against an unfounded claim. But there are two other important points here that must be stressed. First, what is more fiscally responsible: anticipating prolonged periods of low prices and providing price protection that is adequate to handle the situation, or being forced down the road to choose between a farm financial crisis and emergency ad hoc spending because farm policy came unprepared? Second, although price protection may cost more in periods of prolonged low prices, this form of farm policy can also cost very little as has been demonstrated over the past decade where it has been consistently under budget. Failing to Provide Real Market Loss Protection Will Fail Farmers. Having been involved now with going on seven Farm Bills at one level or another, whether it pertains to a revenue plan or a price plan, I firmly believe that real price protection is the CARFAX of Farm Bills. If the Farm Bill you are thinking about buying is not equipped with real price protection, do not just walk away. Run. It may be shiny and new on the outside, but there is sawdust in the engine. As Secretary Vilsack alluded to in an interview in Iowa during a visit to that State by the Vice President of China, world markets can change overnight. Let me give you one example. In 1997, the previous 5-year Olympic average price for corn was $2.51 per bushel. 5 years later, it fell 23.5% to $1.92, and it would not climb back to the 1997 or 1998 levels until 10 years later, in 2008. The current Olympic average price for corn is $3.93. It will climb again for 2012, but all I suggest is that we ought to be prepared if a prolonged drop in prices occurs. As vitally important as crop insurance is and as understandable as is the goal of revenue plans, a price-based protection option offers producers what neither of the former were designed to do: real price protection in times of multiple year low prices, the most basic function of any Farm Bill. Yes, crop insurance does and revenue proposals may help mitigate price volatility within a year, but neither is designed to address low prices stretching multiple years. Instead, their protection levels travel down with prices as I laid out in the example above. Nonetheless, to its authors’ great credit, real price protection did come standard under both the revenue and price options provided in the 2011 Farm Bill proposal. But, of the revenue plans currently being floated, only one attempts to deal with the serious problem of omitting price protection and, unfortunately, it, too, falls short since it would not adequately respond to depressed prices over multiple years because the price protection provided is set so low that it would not kick in until it was too late. But, here, too, credit belongs to the author for recognizing the need and working toward it. To sum up on this point, if Washington wants to sell producers on a policy that provides no real price protection, then Washington should look producers in the eye and tell them that, that there will be no effective net under producers if and when the bottom falls out. Having traveled around the country, visiting producers from all regions growing all kinds of crops, I can tell you, rank and file producers do not understand this important point and they will understand it even less when prices tank. Whether it is revenue or price-based policy, there needs to be real price protection. Criticism Based on Bad Analysis. One of the criticisms leveled against the 2011 Farm Bill was that price protection used under the revenue and price-based protection options were established at levels that would influence planting decisions. But experts disagree. Analysis indicates little influence on acreage planted to major row crops under either plan if prices remain steady. Specifically relating to the price-based option which came under the heaviest attack in this regard, even if every producer in the country elected this option (not likely), and prices declined even by the large percentage drop experienced in the late 1990s, the influence on plantings would be infinitesimal, a fraction of 1%. But, if this negligible influence remains a concern, there is an easy answer: move from planted acres to some updated historical base for revenue and price-based option. Another criticism of the 2011 Farm Bill was its potential to increase WTO exposure. For instance, one farm group’s January 2, 2012 analysis projected that by the fifth year, the bill would have meant a “near 20 percent likelihood that payments would exceed the WTO limit.” But, a subsequent correction made by the same group, issued a couple weeks later, downgraded that risk to “0 percent to 8 percent over the five year period.” Given that the average annual expenditure on the revenue and price-based plans, combined, was, I am told, about $2.7 billion vis-à-vis the WTO limit of $19.1 billion per year, the corrected analysis only confirms what common sense suggests: the 2011 Farm Bill is WTO compliant. Brazil also critiqued the 2011 Farm Bill for WTO implications, largely taking aim at “shallow loss” revenue programs and the moving away from historical bases toward planted acres. But, given that the annual expenditures under the 2011 Farm Bill’s commodity provisions (revenue and price) are not even half the maximum level that would have been allowed had even the lopsided Doha Round limit of $7.6 billion been imposed, the attention paid by the Brazilians toward the 2011 Farm Bill amounts to a great distraction from a real problem. In a set of charts produced by the same farm group referenced above and published in my friend, Jim Wiesemeyer’s column of February 15, it was suggested that price protection was set so high that had it been in place over the previous 10 years it would have triggered. The obvious response is that the price protection in the 2011 bill was not established to address price and cost conditions of the past 10 years; they were established to address price and cost conditions for the future 5 years. And, as was pointed out in a previous article on the subject, as further evidenced by experts indicating negligible impact on planting, and as plain as day by just sitting down at your kitchen table and doing your own mathematical comparisons, the price protection among the crops provided under the 2011 Farm Bill draft pretty well track the average relationship of price protection among crops over the past 20 years, with some adjustments to account for production cost estimates and what producers are losing under the current bill. The farm group analysis published February 15 also suggested that corn, soybeans, wheat, and sorghum would all trigger price-based support in 0 of the next 10 years while peanuts and rice would trigger in each of the 10. But, in the corrected WTO analysis prepared by the same group and published just a month earlier, it is suggested that all of the crops mentioned above would trigger price-based support in each of the next 5 years. Well, which is it? The bottom line is, much like political ads, there is a lot of information out there and often times it seems designed to influence rather than to inform. While neither the revenue nor the price-based protection options proposed in the 2011 Farm Bill are perfect, I do believe both have been unfairly attacked. Rice has been especially hard hit in these attacks. But, as Blake Gerard, a young producer growing rice in Missouri and Illinois, explains, all that has worked for rice producers today under both the Farm Bill and Crop Insurance is the Direct Payment which is the one thing that is being eliminated, and what was meant to replace this payment under the 2011 Farm Bill was $13.98 x .85 x countercyclical payment yields = $8.32, an amount that is well below any rice producer’s cost of production. Rice fared worse under the revenue option. To be clear, rice producers are very grateful for the work the Agriculture Committees did last fall, but rice producers are not doing handstands over the loss of the Direct Payment. Rather, rice entered the Farm Bill discussion with the understanding that this was an exercise in shared sacrifice. Over my lifetime of experience with producers from every corner of the country producing every kind of crop, producers want to earn their living off the market, they don’t want a Farm Bill to be too rich or to eliminate all the risks of farming, and they certainly do not want a Farm Bill policy alone to guarantee a profit. This sort of excess, they will tell you, drives up their cost of doing business and is unsustainable politically, and that is true whether we are talking about revenue, price, or any other kind of protection offered by a Farm Bill. Don’t Add More Bureaucratic Rules. Another thing producers will offer is that they would appreciate if Washington would not add even more to all the uncertainty. Beyond DOL, DOT, and EPA tentacles stretching everywhere, five years ago, the Farm Bill underwent the biggest reforms to pay limits and AGI means testing in the history of farm policy. Do not throw producers into yet another round of uncertainty over these issues when a flurry of uncertainty already surrounds every aspect of business life today. Moreover, crop insurance is insurance and insurance should not be subject to Farm Bill rules. What Farmers Have in Common is Greater than their Differences. In mid-March, producers of nearly every crop you can think of representing 18 farm groups, 32 financial institutions, and 69 Main Street businesses from Minnesota, Texas, Colorado, New Mexico, Oklahoma, and Kansas will converge on Washington united in carrying this message to Capitol Hill. I have always believed and will never be dissuaded that all the things that should unite producers from across the country, whatever the crop and whatever the region, far and away outstrips whatever divides them. If producers pull together and recognize one another’s needs, there is at least a shot of getting a good Farm Bill done this year. If not, we will be back at it next year under much tougher conditions. Larry Combest, a Republican from West Texas, served in the U.S. House of Representatives for nearly 20 years, including as Chairman of the Select Committee on Intelligence and the Agriculture Committee. CIPA is seeking new applicants for membership at all levels. CIPA will consider all agents who meet a strict criterion of personal and professional integrity, in depth knowledge of crop insurance, and have a strong grasp of legislative and regulatory policies and procedure. Each new full member will be granted access to an otherwise restricted area of the CIPA website, as well as an extensive national directory of fellow agents. Members will also receive bi-weekly newsletters and timely, important updates regarding the legislative and regulatory landscape affecting crop insurance. For information on the benefits associated with other levels of membership, click here. To request an application for full, allied or associate membership, click here or to join as a supporting member, click here. Learn more about the Crop Insurance Professionals Association.